The Servant if God Julia Greeley was a familiar sight on the streets of Denver in the late 1800s and early 1900s. Wearing a floppy hat, oversized shoes, and dabbing her bad eye with a handkerchief, Greeley was often seen pulling her red wagon of goods to deliver to the poor and homeless of the city. She had a particularly special devotion to the Sacred Heart, and every month would deliver on foot images of the Sacred Heart and information about prayer to firefighters throughout Denver. Her charitable work earned her the title of a "one-person St. Vincent de Paul Society" from one writer, and made her the Denver Archdiocese’s model of mercy for the Jubilee Year of Mercy. 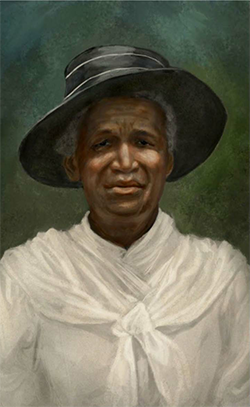 Born a slave in Hannibal, Missouri sometime between 1833 and 1848, Greeley endured some horrific treatment – once, as a slave master beat Greeley’s mother, the whip caught Julia’s right eye and destroyed it. Work with the family of William Gilpin, Colorado’s first territorial governor, brought her to Denver in about 1878. After leaving the Gilpins' service, Greeley found odd jobs around the city. At Sacred Heart Parish of Denver, Julia joined the Catholic Church in 1880. She was an enthusiastic parishioner, a daily communicant, and became an active member of the Secular Franciscan Order starting in 1901. The Jesuit priests at her parish recognized her as the most fervent promoter of devotion to the Sacred Heart of Jesus. Despite her own poverty, Greeley spent much of her time collecting food, clothing and other goods for the poor. She would often do her work at night, so as to avoid embarrassing the people she was assisting. Though she was earning only $10 to $12 a month cleaning and cooking, she used much of it to help other people who were poor. After her death, her body lay in state in a Catholic parish for five hours, during which a constant stream of people came to pay their last respects to the well-known, well-loved woman. 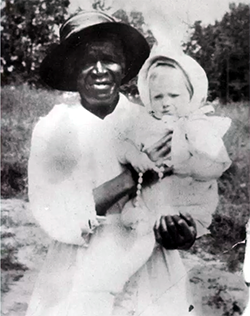 There is only one known photograph of Greeley, holding a child she cared for. The Archdiocese of Denver opened Julia’s cause for canonization in December of 2016, exhumed and moved her remains to the Cathedral Basilica of the Immaculate Conception, where she is the only person buried.